Leaving my husband and child to fend for themselves (...will they starve?...) Carol and I boarded a bus to the Arenal Volcano in Alajuela Province about four hours northeast but a world away in landscape and climate. Surrounded by mountainous pasture land and rain forests, the massive volcano towers above a sparkling blue lake that spans 33 miles and goes 200 feet deep. We arrived in La Fortuna, a small but vibrant town which feels far more affluent than our home base of Tamarindo. After a quick lunch, we headed off to hike the spectacular canyon and swim in the crystal pool at the base of a waterfall which plunges 200 feet through dense foliage. My first glimpse of that majestic cascade took my breath away; its thunderous noise commands full attention and awe. 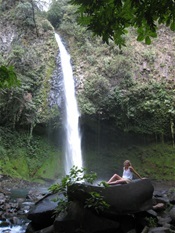 Costa Rica offers constant reminders of the power and spectacle of nature. oh my, the birding must be rather awesome......and every other living thing, butterflies, monkeys, flowers....oh my. And I bet they don't have tornadoes. My birding expertise is something like "hey look at that blue one," but they are spectacular and the bird listening is just as good.